This was the hidden gem of “Back to the Future Day,” right here. While other people were watching Michael J. Fox and Christopher Lloyd (God bless ’em) on Kimmel, and making stupid 2015 memes, comic book fans got a special treat: New Back to the Future content spearheaded by film writer Bob Gale. Plus, it’s a chance for Dan Schoening to draw more ’80s stuff. Frankly, that was all it took to hook me in. 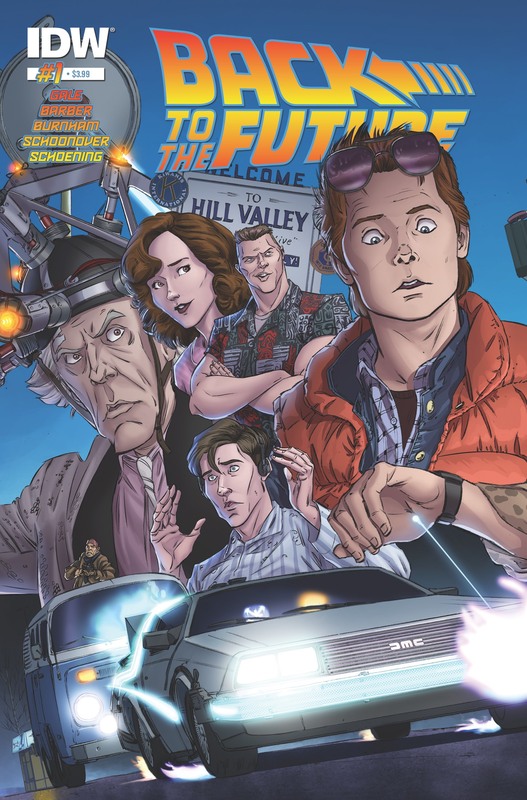 Under the banner of “Untold Tales and Alternate Timelines,” IDW’s first venture into the Back to the Future universe shows us how Marty McFly and Doc Brown met for the first time, and ultimately began to forge the partnership we see in the film. Also, we learn that a younger Emmett Brown was part of the Manhattan Project during World War II. Readers get to see what the inventor of the Flux Capacitor was like as a young adult, and how he was recruited for the war. 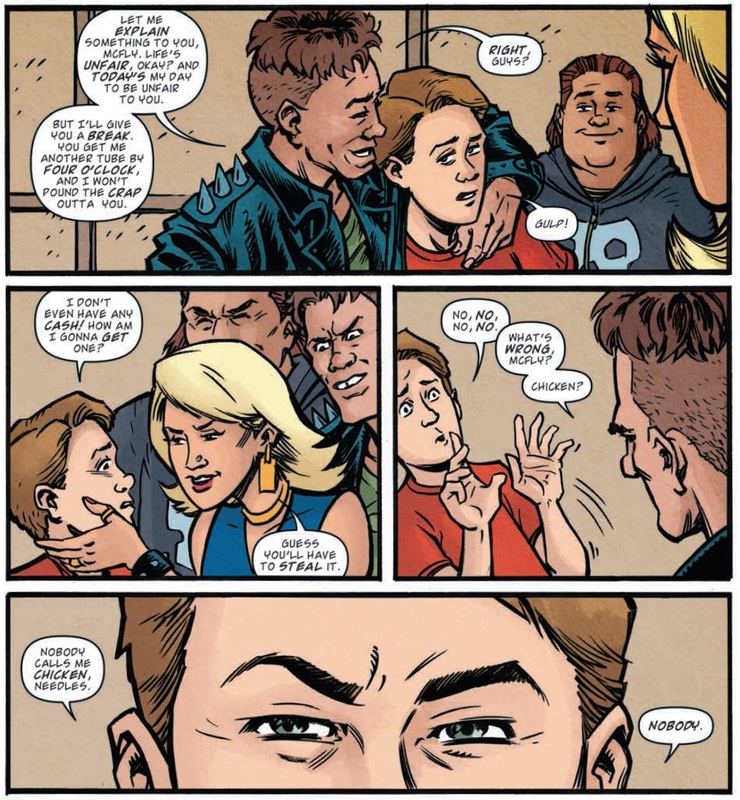 Brent Schoonover’s style is a fine fit for the first story, “When Marty Met Emmett,” in which Marty is bullied into stealing something from Doc’s lab. Schoonover’s take on Doc is excellent, but it takes some time to get used to seeing a younger Marty. Schoonover is in an unenviable position, here. The issue has a Dan Schoening cover, and the second story is drawn by Schoening, but Schoonover’s work is sandwiched between them. At first it feels like a let-down, but he wins you over. Via a time stamp (October 2, 1982), we know that Marty is about 14 in this story. What’s interesting is that when confronted by the bullies, he behaves a lot like his father originally would have. I suspect we see Gale’s influence here, as this somewhat infers that Marty’s relationship with Doc is what turns him into the character we meet in the movie, as opposed to the coward that George was. Marty’s presence is missed in the second story, “Looking For a Few Good Scientists.” But it’s so damn cool to see Schoening draw Doc that you get over that quickly. If you’ve played Back to the Future: The Game, it’s actually quite easy to hear James Arnold Taylor’s voice coming from the figure of young Emmett Brown. Schoening’s rendering of Emmett is fun to look at, as it’s every bit as animated as Christopher Lloyd’s performance. In truth, there’s not much to say about this story right now, as we have yet to get to the ins and outs of Doc’s involvement in the Manhattan Project. What I did enjoy, however, is how the seeds are planted early for the character’s reputation as a crackpot scientist. He initially isn’t put forth for the project because of his unorthodox nature. I can only assume that same unorthodox nature will lead to interesting results next issue. This issue also contains a nice little afterward from Bob Gale about the initial creative process for a Back to the Future comic series, and what ground they did and didn’t want to cover. For die-hard fans, that’s definitely worth a read. At this stage, 30 years after the original film’s release, it’s tough not to be happy with new Back to the Future content of any kind. But the fact that it’s coming from such talented creators, with backing from Bob Gale nonetheless, makes it that much sweeter. Thus far, this series has me locked in for the long haul. Image 1 from comicvine.com. Image 2 from planetcritico.com. This entry was posted in Comic Books/Graphic Novels and tagged Back to the Future, Back to the Future #1 (IDW), Bob Gale, comic book reviews, comic books, Erik Burnham, IDW Publishing, James Arnold Taylor, John Barber, Manhattan Project, Marty McFly, Rob Siebert, single issue reviews, time travel, World War II on 10/26/2015 by primaryignition.